Subjectivity tagging is a prior step for sentiment annotation. Both machine learning based approaches and linguistic knowledge based ones profit from using subjectivity lexicons. However, most of these kinds of resources are often available only for English or other major languages. 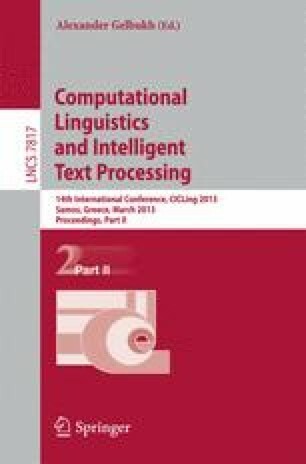 This work analyses two strategies for building subjectivity lexicons in an automatic way: by projecting existing subjectivity lexicons from English to a new language, and building subjectivity lexicons from corpora. We evaluate which of the strategies performs best for the task of building a subjectivity lexicon for a less-resourced language (Basque). The lexicons are evaluated in an extrinsic manner by classifying subjective and objective text units belonging to various domains, at document- or sentence-level. A manual intrinsic evaluation is also provided which consists of evaluating the correctness of the words included in the created lexicons.